Lightning Motorcycles may have been quiet from the electric motorcycle scene lately, but that silence ends now, as the company has announced its next model to accompany the LS-218. It’s called the Lightning Strike, and unlike the high-dollar, flagship LS-218, the Strike is an electric motorcycle for the masses, according to Lightning. Building a motorcycle for the masses means building to a certain price point, and at a starting price of $12,998, the Strike appears to be on the right path for hitting it rich with the masses. It undercuts the $16,495 Zero SR by a fair amount, and comes in significantly less than its $38,888 LS-218 big brother. 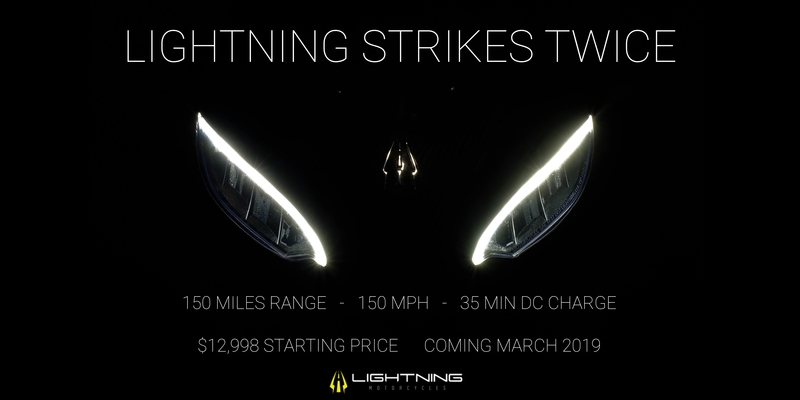 Unfortunately, Lightning is extremely stingy with this teaser and we don’t know specifics about the Strike other than Lightning’s claim of 150-mile range, 150 mph, and 35-minute DC fast-charging capabilities. From the image above, we can see its Ducati 1198-esque headlights, but not much else. We think it’s a fair guess to say the Strike will be fully-faired, probably borrowing styling cues from the LS-218. The official launch of the Strike will come in March 2019, where we expect to get full details on the bike, and hopefully a chance to throw a leg over one for a test ride. We’re barely into 2019, but already this year is shaping up to be an exciting one for electric motorcycle fans. First, Zero announced a new generation of electric models will be unveiled next month. Then Harley-Davidson announced more details for the 2020 LiveWire, along with two other electric concepts. Now with the Lightning Strike announcement, the future is looking bright for electrics. Of course, we’ll have more details as we get them.